RAFOS floats (SOFAR spelled backward) are floating instruments designed to move with the water and track the water’s movements. The SOFAR float was designed as an active device that sent a low frequency acoustic signal to stationary hydrophones that would record the arrival times of the signal. From the arrival times, the floats could be located and tracked. The RAFOS float, however, logs the arrival times of signals from stationary sound sources in the ocean, usually near the study area. Animation showing how a RAFOS float is tracked. The float contains a hydrophone and signal processing circuits, a microprocessor and a battery. The RAFOS float has an accurate clock with which to determine the arrival times of acoustic transmissions. Because the RAFOS float moves with the current, it tracks the path of the current. 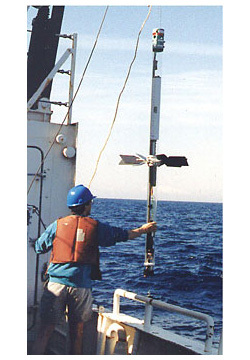 A key element of the RAFOS float is that the instrument does not have to be retrieved for its data to be analyzed. The float is designed to return to the surface and telemeter its data to a satellite system at the end of each mission. The RAFOS float can be weighted to float at any depth. This image shows a type of RAFOS float called a COOL (COastal Ocean Lagrangian) float, with Dr. Mark Prater in the foreground. Courtesy of the RAFOS Float Group at URI. Track of a RAFOS float crossing the North Atlantic Current (top) with corresponding temperature and pressure records (bottom). Courtesy of the RAFOS Float Group at URI.